Make Your Training Work: It’s Time to Chuck the Box! 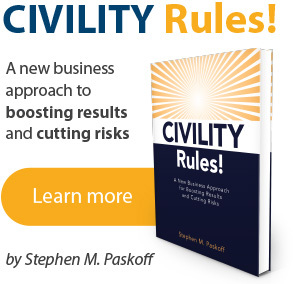 It’s on You: Creating a Culture of Civility in Your Workplace by Tucker Miller, Esq. Breaking Bad: Creating a Culture of Civility and Professionalism by Tucker Miller, Esq. Bringing Big Shots Back to Earth by Stephen M. Paskoff, Esq. by Stephen M. Paskoff, Esq. Presentation: Building a Civil Workplace: What Exactly Do I Do? Beyond avoiding legal risks such as harassment, discrimination and retaliation, we will look at the impact of accepted day-to-day behaviors on various baseball club objectives such as reputation and public relations, diversity and inclusion, quality and performance, talent acquisition and retention, among others. We will also examine how to establish relevant standards applicable from the clubhouse to the front office and how to communicate and reinforce standards on a consistent and on-going basis. Blending both Human Resources and Legal perspectives in a single session, we will offer some practical solutions and insights for building and maintaining a successful workplace culture.